I have over 30,000 miles on them. I have owned several vehicles with Cooper AT3 on them and figured I would give these a shot since I was doing mainly highway driving. They do have pretty decent wet traction and seem to corner well. Now the bad. I have had balancing issues with 2 of the tires from the very beginning. Had to have a road force balance done to get them drive able. The two that I have had issue with have worn differently than the other two. Now they are making noise too. I have kept them on the back of my vehicle because the vibration from them when on the front is rather annoying with the the steering wheel bouncing everywhere. I would not purchase these tire again nor would I recommend Cooper at this point. These were supposed to last 75k but I can't deal with the annoyance of them any longer and trying to save up money to get them off my vehicle. Just replaced worn set of LTX Michelins. I could not be more pleased. It was pouring rain after I had them mounted. Vegas roads are very slick after a rain. Tracked like it was on rails. Too soon to rate treadwear. The absolute best tire I've ever had on any of my SUVs over the years. Super smooth, very quiet and comfortable, great in rain. Best. SUV. Tire. Ever. The SRX came pre-installed on my car. Went through a winter with a major snow storm. Over a foot of snow. I didn't get stuck with these. Do to no small part of my vehicles AWD system. But I do notice they tend to lose grip though. I was in a local city, I wanted to get on the parkway. There was a gap in traffic. I gave my car a little extra gas and the front tires broke lose on wet roads. Mind you my Santa Fe is only a 4 cylinder. I did not stomp on the gas. Another time was during the winter. I was on a road that had patchy slippery spots (nothing major) every time I taped the brake because I was on a incline, my anti-braking system would kick in. In fairness, I was able to climb a fairly steep incline on snowy road and then back down without losing grip. Still like the AT3's better. Ordered a set of 4 through my local cooper dealer and 2 of the 4 were so out of wack they couldn't even be balanced. I've rated all categories poor because a tire that isn't usable couldn't possibly be good in any category. Exceptionally smooth, quite and soft ride. 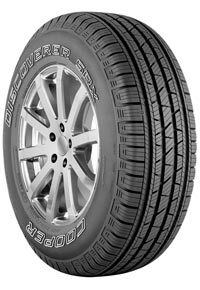 I have recently bought Cooper SRX and can easily say that these are the best tyres I have ever used on an SUV. Not reviewed for the winter traction cause I have not experienced driving in such conditions since I installed these tyres. I will now stick to Cooper. 30,000 miles on these tires and I'm not all together that impressed. Religious about checking tire pressure (32 psi) and rotating tires every 5,000 miles. Cruise control as often as possible. Very conservative driving style. Always trying to maximize mpg. Seem to be wearing poorly. Won't make it through another winter with the tread that is left. Have 15K on the SRX and the tread is wearing well. Very quite and comfortable on freeway and responds well to hard breaking in the city. Looking to put on Lexus 450H next.